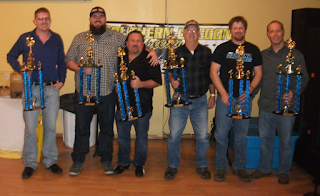 2017 Southern Oregon Speedway champions from left to right; Kyler Barraza (Sprint Cars), Kristopher Mix (Mini Stocks), Mike Medel (IMCA Sport Modifieds), Bob Burkett (Late Models Lites), Jesse Bailey (IMCA Modifieds) and Scott Lenz (Pro Stocks). 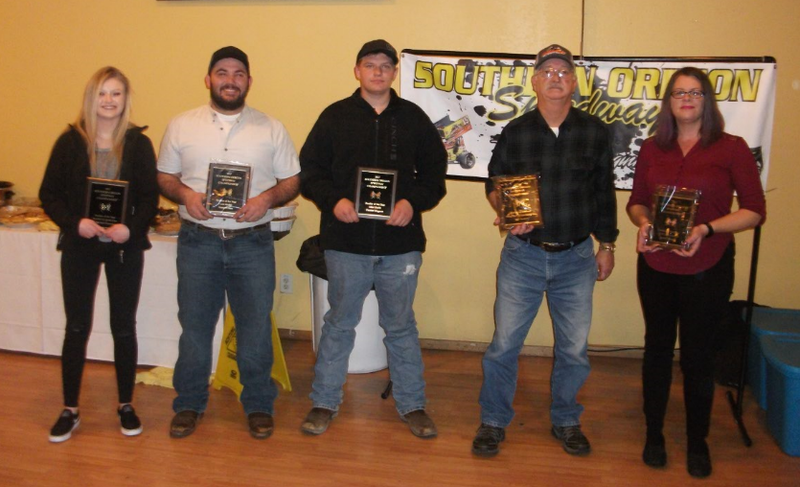 2017 Southern Oregon Speedway Rookie Of The Year winners from left to right; Merissa Henson (Sprint Cars), Garrett Dees (Late Models), Jesse Merriman (IMCA Sport Modifieds), Bob Burkett (Late Model Lites) and Jenna Hedges (JOAT Labs Hornets). Kendall Oil Winged Sprint Car champion Kyler Barraza won three Main Events. 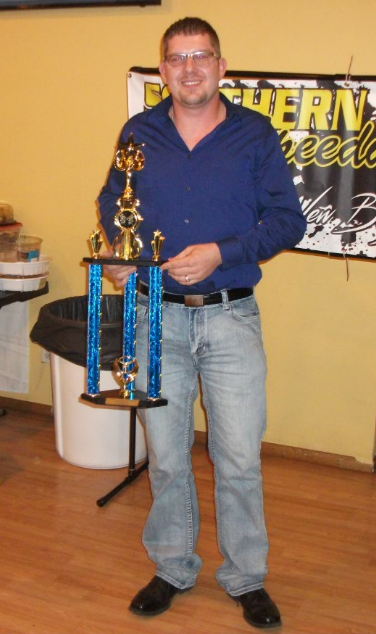 Mike Medel won two Main Events and earned his second straight IMCA Sport Modified championship. Jesse Bailey led the IMCA Modified field with five Top 3 finishes to win the championship. 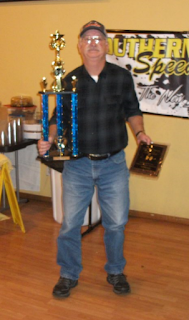 Bob Burkett won both the Valley Stor-All Late Model Lites championship and "Rookie Of The Year" Honors. Jason Stoutenburgh wrapped up the JOAT Labs Hornets championship by winning the last four Main Events. Dr. Scott Lenz won two Main Events on his way to the Pro Stock championship. Kristopher Mix led the field with six Top 3 finishes on his way to the Mini Stock championship. 16 year old Merissa Henson finished second in Sprint Car points and won the Rookie Of The Year award. Garrett Dees won the Late Model Rookie of The Year award and finished seventh in points. 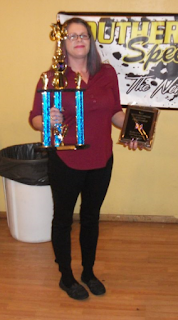 Jenna Hedges was a two time Trophy Dash winner, won JOAT Labs Hornets "Rookie Of The Year" honors and finished second in points. Medford, Oregon...The stars of the 2017 season at Southern Oregon Speedway gathered at Los Arcos restaurant in Medford for the awards banquet. 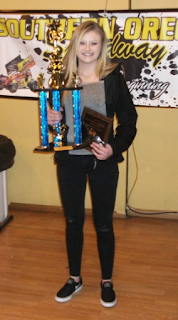 The top drivers in the track's eight regular divisions were presented with trophies from what was the 22nd consecutive season of racing on the 3/10th mile clay oval in White City. Promoter Mike McCann gave the group of nearly 200 attendees his state of the race track address as he prepares for his third season as promoter of the speedway. McCann highlighted some of the struggles and the accomplishments of the 2017 season, which included the first running of the Herz Precision Parts Wingless 360 Sprint Car race, Hall of Fame Night and the R Charles Snyder Salute. McCann also thanked all of the people who worked hard behind the scenes to make it all happen as well as the track's sponsors. With track announcer Bryce Burtner unable to MC the event due to a scheduling conflict, track publicist Don Martin stepped in to handle the duties. Martin emphasized how important each and every driver is to the success of the racing program and why events such as the R Charles Snyder Salute and Hall of Fame night are so important to the heritage of the track. He added that the track just received their five-year anniversary award from IMCA for continuous sanctioning and that IMCA will continue to sanction the popular Modified and Sport Modified divisions in 2018. The track honored eight champions, including Kyler Barraza (Kendall Oil Winged Sprint Cars), Nathan Augustine (Late Models), Jesse Bailey (IMCA Modifieds), Mike Medel (IMCA Sport Modifieds), Bob Burkett (Valley Stor-All Late Model Lites), Kristopher Mix (Mini Stocks), Jason Stoutenburgh (JOAT Labs Hornets) and Dr. Scott Lenz (Pro Stocks). Only Augustine was unable to attend the event. Barraza had seven total Top 3 finishes, including three feature victories. However, his season ended one week from the finish after his car flipped on the back stretch in the Wingless Sprint race at the end of August. The car caught fire and Barraza suffered second and third degree burns. However, he accomplished enough in his other starts to clinch the championship despite missing the final race. Kyler pointed out that his racing was a family effort without big sponsors, and without his family he wouldn't be able to do this. He added that this was his 10th season of racing, and he enjoyed competing with everybody. The Winged Sprint Car division will continue under the Kendal Oil sponsorship. David Hibbard of Dave's Carpet And Vinyl will continue to be a big supporter of the effort and has also launched the ISCS Sprint Car Tour, which will include two other race tracks in addition to Medford. David finished fourth in the standings last year behind his son Bailey. Bailey won three Main Events. However, Marissa Henson beat Bailey Hibbard by just one point to finish second in the standings and win Rookie Of The Year honors. The Top 10 drivers in each of the eight divisions received trophies, and the Dees family was well-represented in Late Models as Bob finished third with two feature victories, son Garrett finished seventh and son John finished 9th. Garrett also won Rookie Of The Year honors. Champion Nathan Augustine won two Main Events out of five Top 3 finishes to out duel three time winner Dustin Knight for the championship. Jesse Bailey did not enter the season expecting to run for IMCA Modified points, but after leading the division with five Top 3 finishes, he won a hard fought battle with seven time champion Mark Wauge and two time champion Albert Gill to claim the title. Gill and Wauge each had a victory. 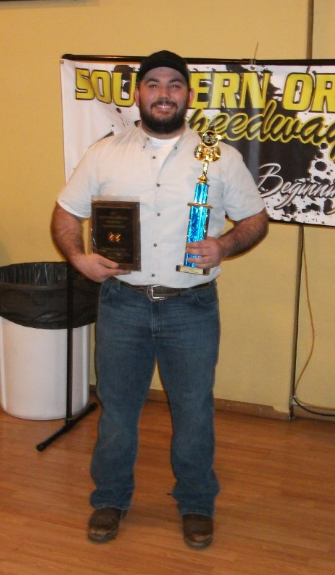 Shane Everson earned the 7th place trophy and Rookie Of The Year. 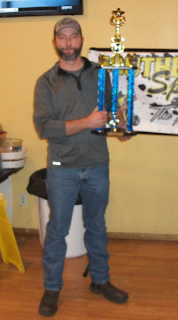 With a new car for the season, Mike Medel set out to defend his IMCA Sport Modified championship. His two feature victories secured him those honors as he had a division leading five Top 3 finishes. Medel praised his fellow competitors, including division point runner-up Willie McFall, for the close competition and the fun that he had each and every week. Jessie Merriman finished fourth in the standings to secure Rookie Of The Year honors. After being one of the stars of the Mini Stock division for over a decade, Bob Burkett used his one win and five Top 3 feature finishes to win both Rookie Of The Year and the Valley Stor-All Late Model Lites championship. Charlie Eaton did a superb job of staying consistent and finishing a career best second. Having raced as long as he has, Burkett felt weird about being the top rookie, but he pointed out that he had fun driving a car that was faster than anything he had raced before. A long shot going into the year, third Generation racer Kristopher Mix surprised the field with a division leading six Top 3 feature finishes to secure the Mini Stock championship. Mix also celebrated the birth of his first son. The rapidly improving Michael Johnson made a late charge on Dillen Lausen to take second in the final standings, while Hunter Magnan finished eighth in points and was the top rookie. Jason Stoutenburgh left little doubt as to who the JOAT Labs Hornets champion would be by winning the last four Main Events of the season. The battle was for second, where rookie Jenna Hedges passed her husband Tim Hedges on the final night. Jenna also won the Rookie Of The Year award. Returning champion Dr. Scott Lenz picked up three Pro Stock feature wins to hold off Rookie Of The Year Dean Hackworth for the championship. Jeffrey Hudson won perhaps the race of the year to close out the season and finished third in the final standings. Many rumors swirled around the room concerning drivers moving into different divisions and other racers coming out for the 2018 season. Promoter Mike McCann indicated that the schedule will be released within the next two weeks. The season opener will be set for April 28th. For further information, go to www.southernoregonspeedway.com. White City, Oregon...2017 marked the 22nd consecutive season of continuous operation at Southern Oregon Speedway. Promoter Mike McCann began his second year at the speedway with an exciting schedule featuring some big events. McCann and crew also struggled during the early portion of the season with numerous problems that threatened to derail the season. However, several big events enabled the season to end on a high note. The Kendall Oil Winged Sprint Cars were back for their second season, and rules adjustments and some support from Dave's Carpet And Vinyl helped boost the numbers. Kyler Barraza, who is a two time Southern Oregon Sprint Car Tour champion, returned after taking a break and mounted a serious challenge for the championship. Jake Waddell was a surprise visitor and scored the victory in the season opener ahead of Barraza. The season opener marked one of the moments that affected the championship battle as Bailey Hibbard crossed the finish line in third but bypassed the scales and was disqualified. Barraza won his first of three Main Events at the second event, and B. Hibbard rebounded for his first of three wins at the third race. With seven Top 3 finishes and three Trophy Dash victories, Barraza built such a big lead that even missing the final race due to burns suffered in a fiery crash at the Herz Precision Parts Cascade Sprint Car Challenge race couldn't stop him from winning the championship. Bailey Hibbard did all that he could in winning the season finale for his third victory, but Merissa Henson crossed the line in fourth to hold him off by just one point. Henson finished second in the points with Rookie Of The Year honors, and her best Main Event finish of the year was third. After three straight second place feature finishes, David Hibbard finally got his one victory and ended up fourth in the standings ahead of rookie Enrique Jaime. Jaime had a heat race win late in the season and a season high third place Main Event finish. David Hibbard won one Trophy Dash with Barraza winning the other three. Jake Wheeler made an appearance late in the season and held off Barraza for the victory. Cooper Desbiens, Camden Robustelli and Tanner Holmes each had a season high second place feature finish. The $3,000 prize in the Herz Precision Parts Wingless Sprint Car Challenge was won by Californian Geoff Ensign ahead of Cody Fendley and Cottage Grove 360 Sprint Car champion Kyle Miller. The Late Model division gathered more momentum and featured an exciting battle between Coos Bay champion Nathan Augustine and past Pro Stock and Modified champion Dustin Knight. There were four consecutive different feature winners in the first four races as Augustine, Knight, Trent Elliott and reigning champion Bob Dees collected the wins. The battle intensified as Knight and Augustine when the next two races, and Augustine led the division with four Trophy Dash victories. Round #6 was the game changer as Knight crashed exiting Turn 2 early in the race and finished last. He rebounded to win the seventh event for his third win of the season (to go with his three seconds), but a scheduling conflict kept him from running the final race. Augustine was the point leader headed into that race, but got a flat tire that night to finish last. Bob Dees scored the win in that race for his second victory of the season. Augustine was the champion with two wins and three seconds. Knight finished second in the standings ahead of B. Dees. Dave Foote used his third third place finish of the season in the finale to take fourth in the standings from Kristy Grout. Californian David Newquist and Rookie Of The Year Garrett Dees each had season high second place finishes, while hard luck racer Mike Linder and Kristy Grout each had a season high third. Knight, B. Dees and John Dees won one Trophy Dash each. 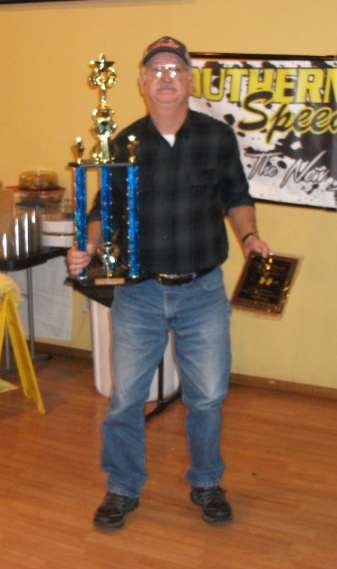 The IMCA Modified division was so competitive that there were no repeat winners throughout the season. There was also a question as to who might win the championship. Car count was strong at the three marquee events as Californian Troy Foulger captured the $5,000 first prize in the first R Charles Snyder Salute event, followed by seven time track champion Mark Wauge. Nick Trenchard collected a $1,700 first prize with his victory in the Rodger Haudenshild Tribute in front of Albert Gill. The $1,000 prize in the Wild West Speedweek Tour race went to Californian Danny Lauer ahead of John Campos. Longtime competitor Monte Bischoff won the season opener and was a Trophy Dash winner the next week before falling out of competition. Californian Derek Nance made a surprise visit in round #3 and used traffic to take the victory from Gill. The fifth event was a victory for Gill, who declared his intent to run for the championship. However, Gill was a no show in the sixth event, won by Zach Fettinger ahead of a season high second place finish for Jesse Bailey. Bailey led the division with five Top 3 finishes. Though he didn't have a strong showing in the R Charles Snyder Salute, Bailey did make the big money Main Event, while Gill did not. Because of that, Bailey had pretty much clinched the championship heading into the season finale. Wauge ran a patient race that night and took the lead from early leader Kevin Hewitt. Once in front, Wauge became the ninth different winner in nine races ahead of a season high second place finish for Preston Jones. While Bailey was the champion, Wauge overtook Gill for second in the standings. Preston Jones would finish fourth in the final rundown ahead of Ray Kniffen Jr. Jeremy Richey had a season high second place finish in the preliminary feature during the R Charles Snyder Salute. Collen Winebarger and Bobby Hogge IV each had a season high third. Only Bailey won more than one Trophy Dash as other wins went to Kniffin, Gill and Hogge. With a new car, Mike Medel set out to defend his IMCA Sport Modified Championship. However, he faced the familiar challenge of two time champion Jorddon Braaten, who won the first two races and forced Medel to settle for second each night. When Braaten elected to pull out of the championship battle, Medel won the next race ahead of Rich McCoy. After a hot lap crash at the season opener sidelined him, McCoy was forced to play catch up for most of the season. Braaten appeared to be the winner in the Speedweek race, but a tech disqualification handed the win to Californian Brian Cooper. However, the Braaten team produced a letter proving that they had passed technical inspection of their motor after a thorough teardown, though the decision by IMCA would not be overturned. When McCoy scored back to back feature victories, two time Main Event runner up Willie McFall, McCoy and Medel were very much in the running for the championship heading into the pivotal R Charles Snyder Salute. McFall struggled all weekend and failed to make into the big show. McCoy was one of the fastest drivers all weekend, but motor issues ended his Main Event on Sunday. Medel stayed consistent and smooth with a Top 5 finish to all but clinch the championship heading into the finale. If there were any doubts, Medel won the final race for his second win of the season, successfully defending his track championship. McFall finished second in the standings ahead of McCoy. Braaten won his last two starts, and his wins in the R. Charles Snyder Salute and Roger Haudenshild Tribute each paid over $1,000. With a season high third place finish, Jesse Merriman was the top rookie and finished fourth in the standings, followed by David Marble, who had a season best second place feature finish after a very rough start. Season high second place feature finishes were also earned by Todd Cooper, rookie Justin McCreadie, Alan Furuta and Matt Sanders, while Tony Bartell, Jimmy Lipke, Craig Nieman and Oregon State champion Jayson Nelson had season high thirds. McCoy, McFall and Braaten each had two Trophy Dash wins, while Medel had one. David Steele carried his experience advantage into the Mini Stock championship battle, and after his strong ending to 2016, he appeared to be the driver to beat. Steele opened the season with back to back Main Event victories, but he blew three straight motors in the races that followed. 2014 champion Gary Anderson and 2013 champion Steve Goetz won the next two races with Anderson winning again in Round #5. Unfortunately, these two drivers had enough mechanical issues to keep them from making a serious championship bid. Teen leadfoot Dillen Lausen won a heat race at the opener, finished a season high second in the next Main Event and was third in the next race to take the early point lead. However, he was about to be challenged by unlikely contender Kristopher Mix. Mix opened the season with a third and had a season high second in the third event. Mix led the division with 6 Top 3 feature finishes, and Lausen began to struggle at the midpoint of the season. This opened the door for another hard charging teen, second generation racer Michael Johnson. Johnson began his charge up the ladder with a third place finish in the fourth event and a second at the following race. Johnson clearly established himself as a threat for the championship when he won the sixth event and followed that up with a runner up finish at the next race. It fell apart for Johnson at the second to last event. Johnson was running second, trailing David Steele by straightaway. Hoping to catch him, Johnson made contact with the front and back wall and ended up with a flat tire. He finished further back and as a result would need major bad luck for Mix to win the championship. However, Mix ended the season with four straight third place finishes and won the championship, while Johnson used his third second place finish in the finale to overtake Lausen for second in the standings. Steele won the last three Main Events and a total of five to finish fourth in points ahead of teammate Goetz. Marissa Luckman had a second place finish in the first event, and Andrew Hall had a season best third place finish at the second race and was also a trophy Dash winner. Only Steele repeated as a two time dash winner, while Bob Burkett, Lausen, Goetz, Johnson and Mix also won Trophy Dashes. The steady Hunter Magnan won top rookie honors. The Valley Stor-All Late Model Lites gained Mini Stock veteran Bob Burkett in their ranks along with division super star Bob Westcott, who split driving duties with Randy Hansen. Reigning champion Lee Doty won the opener and finished second at the next race behind Westcott. Doty was the early point leader, but a broken rear end in mud packing at the third event and a roll over at the next event ended the season for Doty. With one win and four second place finishes along with four dash victories, Burkett made a serious bid for the championship. Burkett's closest challenger was Charlie Eaton, who picked up four third place finishes and a season high second. The championship was close heading into the finale, but Burkett's fourth second place finish and Trophy Dash win clinched the title for him. Eaton was a career best second in the final standings, followed by Greg Arnold. With a win in the season finale, rookie Dusty Aos tied Bill Spencer for fourth in points. Danny Prewitt and Greg Arnold each had season high third place finishes while Hansen was the only other Trophy Dash winner. Hansen also won two Main Events. Burkett was the top rookie in the standings. The JOAT Labs Hornets saw an increase in car count as the new title sponsor began building cages for new competitors. The season opened with Joby Shields winning the Main Event, followed by a win in the next event by David Coggins. However, both competitors dropped out of the point race. The battle would be between reigning champion Tim Hedges and past Thrill Car champion Jason Stoutenburgh. The controversial third event saw a crash on the back straightaway between Stoutenburgh and Coggins, resulting in confusion as to who's the leader was. Initially, Zach Nelson was declared the winner, but it was discovered that T. Hedges was first. Hedges gained the point lead with his second straight win the next week, combined with a flat tire on the opening lap for Stoutenburgh. Unfortunately, this was the high water mark for Hedges, who failed to even earn a Top 3 finish in the final four events due to serious mechanical issues. Stoutenburgh left little doubt as to who the champion was by winning the last four races. Jenna Hedges had a season high second and third place finish along with two Trophy Dash wins, and she was able to overtake her husband Tim for second in the final standings. Ashtin Hedges had a season high third place feature finish to finish a solid fourth in the standings, and second generation competitor Dylan Irving finished third in the second to last race and won both the Trophy Dash and his heat race in the finale to hold off Derrel Nelson Jr. and Brandon Wonsyld for fifth. D. Nelson had two season high second place finishes while sons Zach Nelson and Ryan Nelson each had one. Scott Pierce and Wonsyld each had one second. John Corder had a third place finish. Stoutenburgh was also a two time Trophy Dash winner while Tim Hedges and Shields also had one dash win. An attempt was made to bring the Pro Stocks back under the track's promotional umbrella with their first track champion since 2011. The question was, who would race for it? Pro Stock Association members were reluctant to come on board, and an early season rainout for the association was moved to Yreka, rather than attempting to reschedule. This meant that only three of the seven remaining dates would receive full support from the association. Josh Kralicek and Derrel Nelson Jr. supported an eventful first race that saw Kralicek get a flat tire while leading and Nelson hit the wall coming out of Turn 4 to limp to the pits in victory. Nelson lost his ride after the second event. The second race was the association supported Roger Haudenshild Tribute, won by Dr. Scott Lenz ahead of James Flowers. Kralicek won the Trophy Dash that night, but he missed the next race, won by Lenz ahead of Miles Deubert. Lenz missed the next race as Jeffrey Hudson won ahead of rookie Dean Hackworth. This moved both drivers into championship contention. The car count grew as the association supported the next race, another win for point leader Lenz ahead of Scott Flowers. Lenz missed the next race due to family commitments, but Hudson's potential move into the lead never happened. This was because car owner Scott Bennett drove the car to a feature win ahead of Bryan Hammond. Hackworth was the only driver with a shot a Lenz going into the association supported finale. Lenz drove the borrowed Roy Bain car to a dash win and struggled as the first car a lap down in the feature. However, he did what he needed to do to clinch the track and association championships. Hackworth settled for second in track points along with top rookie honors. Meanwhile, the season finale saw Hudson win the race of the year with a thrilling last lap pass on James Flowers for his second victory. Hudson finished third in points ahead of Kralicek and J. Flowers. Lenz won three Trophy Dashes, while Hudson and Bennett each won one. The Southern Oregon Dwarf Car Association ran most of their races at Southern Oregon Speedway, and Brock Peters successfully defended his club championship. 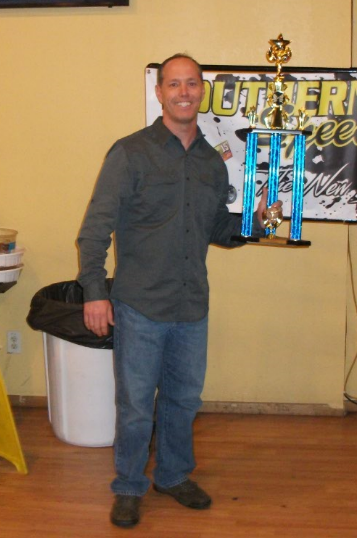 Peters won four of the first six point races at Southern Oregon Speedway and was second in the two races he did not win. Because of his strong start, he held off Chad Cardoza and Ryan Smith in a good battle. Cardoza had a season high second place feature finish as did Smith. Camden Robustelli opened the season with a thrilling victory ahead of B. Peters and son Cody Peters. 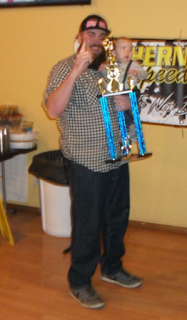 Cody had two second place finishes and two thirds in point competition at his home track, but the best would come later in the season. Two time champion Josh King picked up a pair of feature victories, and late season surprise victories were earned by Mason Lewmen and Rob Gergel. Gergel battled Kalvin Morton, who ended up with a season best second in the finale. Peters and Cardoza each had three A Dash wins, while Robustelli had two and C. Peters had one. At the Dwarf Car Nationals, Cody Peters made a thrilling last lap pass on NorCal Dwarf Car champion Danny Wagner to win the Pro Main Event, which was the biggest win of his young career. Kevin Bender won the Veteran feature and the Veteran preliminary feature. Josh Wiesz won the Sportsman feature and the Sportsman preliminary feature, while Michael "Spanky" Grenert won the Pro preliminary feature. Roughly 70 competitors from the around Oregon, California and Nevada were on hand for the Western States Dwarf Car Nationals event. The Old Time Racers of Oregon Hardtops ran for fun, not points. Mark Minter brought the Minter family's Old Pink #33 car back after being away for a couple of seasons. This is one of the original cars that competed when OTRO began several years ago. Minter won the season opener ahead of Dusty Trotter and followed that up with a win ahead of Bruce Wilkerson at the next race. Jamie Britton, a PRA competitor on the pavement in Roseburg, was a surprise visitor at the opener. Britton found that he had a preference for dirt and joined OTRO that night. After back to back third place finishes, Britton won the next two races. The final race of the season was a victory for Rhett Lange as Bruce Wilkerson settled for his second runner up finish. Wilkerson was driving for Vic and Louise Bridges. 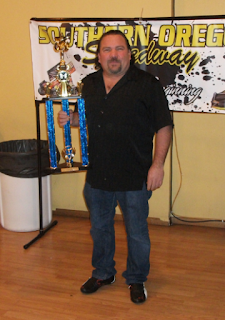 Vic Bridges was the president of the group and secured the dates for OTRO at Southern Oregon Speedway for these past two seasons. Sadly, he passed away during the off season. A season high second place finish was earned by Bill Trotter, while Kevin Lowell had a season high third. Trophy Dash victories were earned by Brian Crouch, Jimmy Del Castille, Jamie Britton, Bill Trotter and Dean Cast. Much like last season, there were no repeat Trophy Dash winners. The first event for the Road To The Iron Giant Street Stock Series came to Southern Oregon Speedway. Donald Schott won the 50 lap $1,000 to win event ahead of hard charger Kyle Yaeck and Washington visitor Jack Parshall. The Northwest Focus Midgets were a part of the Open Wheel Showcase event that ended the month of May. Over 20 competitors where on hand from the Washington based group, and Tristin Thomas won an exciting event ahead of Michael Volbrecht and Chance Crum. The Pro 4 West Modifieds were a part of that program with the win going to Tobey Ferrando.